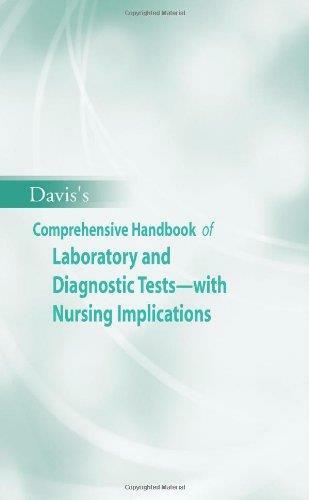 Here’s the information nurses and nursing students need to know about laboratory and diagnostic tests! This nursing-focused, easy-to-read handbook provides all of the information you need to understand how tests work, interpret their results, and provide quality patient care, including assessing, monitoring, and teaching at every stage of care—pre-test, intra-test, and post-test. Tests and procedures are listed in alphabetical order by their complete name for quick reference. The integrated index allows fast searches by abbreviation, synonym, disease/disorder, specimen type, or test classification. Plus, a Body Systems Appendix includes a list of common laboratory and diagnostic tests for each body system as well as nutrition-related lab tests. Monographs each written specifically to focus on what you need to do before, during, and after each laboratory and diagnostic test. Unique coverage of laboratory and diagnostic tests for subspecialties, such as maternity, therapeutic drug monitoring, nutrition and sensory. Reference ranges expressed in both conventional and SI units (with the SI unit conversion factor) include age and gender-specific variations when indicated and normal variations due to cultural considerations.